Srila Prabhupada is a pure devotee always, being an eternally liberated associate of the Lord. He did not have a material past at any time. Being an associate of Lord Sri Krsna, he is properly understood to never have been contaminated by matter. As we knew him, his so called material body was not at all material. Heat, cold, happiness and distress, hunger and thirst, birth, disease, old age, and death never touched him. It is not correct that he felt or suffered these mundane influences and pains in a mood of tolerance. He never even felt them, according to the scriptures. There are two types of pure devotees: (1) the neophyte pure devotee (sadhaka), and (2) the perfect pure devotee (parishat). The Lord’s associate is also described as a nitya-siddha. “A pure devotee of the Lord does not live on any planet of the material sky, nor does he feel any contact with the material elements. His so-called material body does not exist, being surcharged with the spiritual current of the Lord’s identical interest, and thus he is permanently freed from all contaminations of the sum total of the mahat-tattva. Being freed from this material nature is the primary meaning of the qualitative oneness with the Lord (saksad-hari) which the pure devotee has realized. “The Lord comes to this material world through the agency of His internal potency, and, similarly, when a devotee or associate of the Lord descends to this material world, he does so through the action of the spiritual energy. Srila Prabhupada’s body has nothing to do with matter. It is spiritual. We have humbly endeavored to explain to some small degree, with reference to Srila Prabhupada’s books, the status of His Divine Grace’s so-called “material” body. Yet, the Lilamrta does not tally with these quotations. To write a biography of the pure devotee, telling how the spiritual master is influenced by material elements is similar to writing a description of the Deity in the temple as being a mundane statue. The Lilamrta was researched by several disciples who interviewed karmis who think the bonafide spiritual master to be, at least in some respects, an ordinary man. The Lilamrta attempts to show that Srila Prabhupada becomes fatigued, goes into ignorance, gets heatstroke, diseased, starves, suffers from old age, has imperfect senses, etc. The following pages include some of the Lilamrta’s thoughts, compared to Srila Prabhupada’s thoughts on the same subject, as found in his books. The Lilamrta claims that Srila Prabhupada becomes drowsy and dozes. Webster’s Dictionary defines drowsy as “indolent and lethargic”. The Lilamrta claims that Srila Prabhupada became unconscious due to heat. The Lilamrta claims that Srila Prabhupada was dangerously old. It says that he was, as are most old men, like a toting father. The Lilamrta claims that Srila Prabhupada was starving. Dhruva Maharaja was so advanced that he only took one breath of air every twelve days, and his strength and happiness increased immeasurably. In transcendental ecstasy. Raghunatha Gosvami ate one slice of butter every alternate day. Queen Kunti fasted without inconvenience for thirty days. Because he was on the same transcendental platform as these great souls, Srila Prabhupada could not have suffered a starving condition. What to speak of Srila Prabhupada, who is the greatest yogi, even mystic yogis who are still siddhi-kami can live without food and not suffer the pangs of starvation. Srila Prabhupada had no material drives and, therefore, he was never victimized by hunger or any other law of material nature. The Lilamrta claims that Srila Prabhupada suffered the affliction and great inconvenience of disease, seasickness, and ill health. The Lilamrta speculates that Srila Prabhupada had imperfect senses. 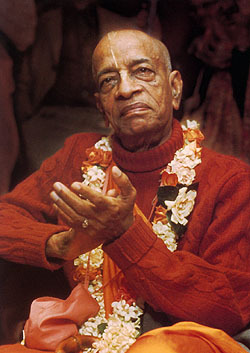 Srila Prabhupada’s position is similar to that of Krsna das Kaviraja. So even if Srila Prabhupada had himself told this story, we would not have taken his “imperfect senses” story literally. To think of the spiritual master as having a material body, subject to material defects, is to think of the bonafide spiritual master as fallen. If one were requested to fully surrender one’s life to a personality who himself becomes baffled, frustrated and discouraged, who is affected by mistakes and failures, who becomes morose when there are unfavorable results, and who can rather easily become shocked or shaken, would you be strongly inclined to surrender yourself to such an individual? If one were further asked to surrender one’s life to a person who shudders at the thought of Krsna taking his money away and who gets embarrassed, bewildered, and perplexed on occasion, and who is enamored by the Lord’s illusory energy (except when his heart cracks upon hearing noises in the n cities), would be strongly inclined to fully surrender himself to such a person? And if you would and could surrender your life to the person who has the mundane qualities described above, would you be surrendering to a completely realized soul? Not according to the sastra, although the Lilamrta might try to convince you that you were. His Divine Grace Srila Prabhupada has none of the above-mentioned material disqualifications. His mind and emotions are fully spiritual, and are always absorbed in transcendental bliss. Since he is situated on the same platform as Lord Krsna, his mind, emotions and activities are not able to be appreciated by the Lilamrta’s method of mental speculation and direct sense perception on the part of conditioned souls. Such mundane understanding can easily be discarded. Transcendence is not understood, after all, by the ascending process. Relying on the mental speculation and clouded memories of devotees (since we are virtually all neophytes), or on ex-devotees and karmis, the spiritual truths can easily be distorted. Some of the tales such people may tell may not even have any truth in them. For example, one devotee, after reading passages of the Lilamrta spoken by Srila Prabhupada’s printer in New Delhi (Mr. Sharma), commented to a research editor of the Lilamrta, “What a nice devotee Mr. Sharma was to have helped Srila Prabhupada like he did.” The research editor replied that Mr. Sharma was not at all that nice, in his estimation. The explanation continued to the effect that, because Srila Prabhupada is now famous, everyone in India wants to say that it was he who helped him. These are not the kinds of people from whom we should hear of the topmost paramahamsa, Srila Prabhupada. Even the most significant events are difficult to remember clearly, when such incidents occurred anywhere from five to fifty years previously. Kali-Yuga is notorious for bad memories. If we want to understand His Divine Grace Srila Prabhupada, we can do so properly by hearing from he himself. The sastra, however, informs us that the nitya-siddha devotee, even in childhood, is never enamored by matter, because he is always absorbed in rasa with Krsna. The sastra, however, informs us that the pure devotee is not interested in matter like the mundane man, because he sees the material varieties as products of nescience, with no real value. The Lilamrta speculates that Srila Prabhupada was attached to matter. Webster’s Dictionary defines shuddered: “to tremor convulsively; to quiver, shake”. PRABHUPADA SHUDDERED?The Lilamrta speculates that Srila Prabhupada was attached to matter. The sastra, however, informs us that the pure devotee only cares for Krsna’s happiness – not any material situation for himself. Krsna’s happiness is his happiness. Being fully surrendered to Krsna, the pure devotee knows that Krsna will take care of him. He never worries about such things. One who is concerned about material benefits from Krsna can be a pious man, but he cannot be a pure devotee. The verse cited by Lilamrta, concerning Krsna’s taking away the wealth of a devotee who is still attached to possessions and society, does not appear to be relevant, because it does not apply to Srila Prabhupada. It applies to the imperfectly realized devotee, who still has material desires. PRABHUPADA HAD TO BECOME SETTLED IN DETACHMENT?The Lilamrta claims that Srila Prabhupada was so attached to family life, that he had to become artificially settled in detachment. PARAMAHAMSA AS HIGHEST PERFECTIONAL STAGE OF LIFEBEYOND ATTACHMENT AND RENUNCIATIONHowever, the sastra states that the nitya-siddha paramahamsa is beyond both attachment and renunciation. OF DEMONS AND NON-DEVOTEESThe Lilamrta says that His Divine Grace Srila Prabhupada felt mundane awe, admiration, and tension towards and in relation to karmis. The sastra, however, tells us that the pure devotee never has a high regard for atheistic teachers, no matter what their so-called “good qualities” are. According to sastra, neither does the pure devotee make bodily distinctions, which are always based on ephemeral high and low positions. Although respectful to all living entities (B.G. 5.18), a pure devotee doesn’t view karmi teachers as actually being superior or more educated than the others. They are all ignorant, being devoid of Krsna consciousness. PRABHUPADA SHOCKED?The Lilamrta speculates that His Divine Grace Srila Prabhupada was shocked, shaken, and greatly affected by the hellish conditions of this world, especially in the cities. NEVER SHAKENSastra, to the contrary, states that heaven or hell are the same for the pure devotee, because he is transcendental to both. He is never shaken, even amidst the greatest difficulty. – PURE DEVOTEE ALWAYS SITUATED IN VRINDAVANAThe Lilamrta offers that His Divine Grace was affected by the hellishness of America, to such a degree that he wanted to get away and return to Vrndavana as an escape. But sastra tells us differently, that the pure devotee is always in Vrndavana or Vaikuntha. He is always experiencing Vrndavana or Vaikuntha, and he creates that asmosphere even for others, wherever he goes. Sometimes we compare His Divine Grace Srila Prabhupada with ourselves. We can think, “Prabhupada is engaged in devotional service, and I am engaged in devotional service. Prabhupada is in Vaikuntha, and I am in Vaikuntha. He says that the temples are Vaikuntha, and I am in the temples.” However, we don’t actually experience Vaikuntha, due to the conditioned covering. We experience all too often our own minds, the sounds on the street, etc. We can think of Vaikuntha as a concept only, and we may not even realize that we are intellectualizing. We are engaged in sadhana-bhakti. However, His Divine Grace Srila Prabhupada is, and always was, engaged in prema bhakti. Therefore, he actually experiences Vaikuntha. AND FAILURE OF THE VENTURE?The Lilamrta speculates that His Divine Grace deeply felt his successes and failures. However, the sastra tells us that the pure devotee, in direct and unadulterated contact with the Supreme Lord at every moment, is not attached to the results of his activities in devotional service. Srila Prabhupada’s comparing himself to Vasudeva is significant. A careful study of this purport reveals that we cannot begin to understand the nature of Srila Prabhupada’s transcendental fear, any more than we can understand Vasudeva’s trembling. It is transcendental rasa. Srila Prabhupada is fully aware that Krsna can protect Himself, as well as His own movement. Srila Prabhupada sees personally how Krsna is controlling the universes – as did Vasudeva and Devaki. Srila Prabhupada’s being “afraid” has nothing whatsoever to do with the fear of this material world to which a conditioned soul is repeatedly subjected. There is a difference between emotional ecstasies and mundane anxieties. Emotional ecstasies are not produced by anything in this material world. The pure devotee is not affected by anything produced in this world. This is quite clearly defined in the sastra. Generally, we cannot know what specific ecstasies are being experienced by the completely realized soul, at a specific time. We can hear about them, sometimes, from the pure devotee himself. We can also hear of the ecstasies of self-realized souls from authoritative revealed scriptures, and appreciate the truly self-realized pure devotee of the Lord in terms of sastra. PRABHUPADA FRUSTRATED, BAFFLED AND PERPLEXED?The Lilamrta claims that Srila Prabhupada became materially frustrated, baffled, and perplexed. The definition, according to Webster’s Dictionary, of predicament is: “a perplexing situation”. The Dictionary further defines baffled as: “to be defeated or checked by confusion”. Frustrated is defined as: “to defeat in an endeavor; to make invalid; to bring to nothing”. Sastra rejects this claim, and informs us that His Divine Grace could never have been baffled. As the bonafide spiritual master, he took all others who surrendered to him (due to their becoming baffled as to the right path of action) to the shelter of Krsna consciousness, which is free from perplexity. However, sastra states that Srila Prabhupada was never actually unhappy at any time. He is always in equilibrium and bliss in all material circumstances. Unaffected means just that – unaffected. It does not mean affected, but struggling to be unaffected. This may indeed be our position, but that is not the pure devotee’s position. He does not even feel the dualities, according to sastra. The pure devotee is like the ocean; material happiness and distress are like the rivers; and Krsna is like the moon. So many rivers may enter the ocean, but the ocean remains calm and steady. However, when the moon rises in the sky, no one can check the ocean tide. Similarly, so many material happinesses and distresses may try to disturb the pure devotee, but he always remains undisturbed, calm and steady. However, when the Moon of Krsna rises in the pure devotee’s heart, he becomes like a madman, full of transcendental emotions. PRABHUPADA EMBARRASSED?The Lilamrta says that His Divine Grace felt embarrassed. Webster’s Dictionary defines embarrassing as: “to cause or experience a state of self-conscious distress, an influence which impedes thought, speech, and action”. To the contrary, the sastra states that the liberated soul is never embarrassed by any material condition. Embarrassment is the plight of the conditioned soul. The Lilamrta theorizes that things were sometimes mysterious for His Divine Grace. However, sastra states that nothing remains a mystery to the pure devotee. PRABHUPADA ASHAMED? REGRETTED?The Lilamrta offers that His Divine Grace Srila Prabhupada made mistakes and felt shame, regret, and had to check himself from violent emotions on occasion. But sastra tells us differently, that the fully liberated soul, unlike the conditioned souls, is not subject to mistakes, nor does he possess the other three disqualifications of conditioned life. He never has any reason to feel regret or shame about anything he is doing, nor does he have to check himself from any violent emotions, because he has no material emotions and cannot make the mistakes which cause conditioned souls to vent material emotions. We may say that Srila Prabhupada is a completely spiritual person and that, since he is therefore like Krsna, he can only be understood from a spiritual point of view, through the medium of bonafide sastra. This is true. However, sometimes we may turn the understanding of the sastra into half-truths, by concocting that the bonafide spiritual master may also be seen and understood from a material point of view. Thus, we will not be able to understand the whole. Our understanding becomes a mis-understanding. If someone in the name of glorifying His Divine Grace Srila Prabhupada, also criticizes him by attributing to him such mundane qualities as destitution, insecurity, vulnerability, directionlessness, familiar attachment, dependency on anyone and everyone, attainment of knowledge via material experiences, etc., then Srila Prabhupada’s spiritual authority is brought into question. Interpreting the Vedic literature minimizes the authority of the Vedas. Mixing the spiritual with the mundane allows the mundane to be accepted as spiritual, and the spiritual to be considered in a mundane manner. There is an example of the gardener who allows a mad elephant to enter his garden, and then rationalizes, “Only 50% of my activities were mistaken. I cultivated the garden very nicely but, on the other hand, I permitted the entrance of that mad elephant.” However, whatever percentage of mistake the gardener wishes to concede, the result is nevertheless that the entire garden is destroyed. There is another example of a spiritual truth given by Srila Prabhupada wherein the elephant is also used. The elephant takes a bath in the lake and, upon coming out, throws dust all over his body. Thus he defeats his bath’s purpose. the elephant may try to rationalize, “I made only 50% error in throwing this dirt upon myself, but the other half of my activities made me very clean!” However, what is the genuine use of his good bath at this point? Even if we unknowingly commit offenses to the completely realized bonafide spiritual master, we are held responsible and there are problems for us. One may admit that “Brahman is supreme and great”. However, if one then concocts, “and that Brahman is impersonal,” the whole statement has become spoiled. It has become a blasphemy to Lord Krsna, the Supreme Person, even though Brahman is great, and that clause is included in the distorted statement. When someone interprets sastra and bonafide purports of sastra, inevitably there will be some correct statements scattered throughout the polluted propaganda. But, Lord Caitanya says that it loses its value. Such misinterpretation misleads us and contaminates the self-evident, bonafide conclusions. We then cannot understand the whole. If someone says, “Srila Prabhupada was fully dependent on Krsna,” but then adds his own concoction that “he was also confused, insecure, materially attached, dependent on karmis and mayavadis, etc.,” the entire statement becomes polluted and misleading. It minimizes the value of His Divine Grace as being “fully dependent on Krsna.” If we accept this two-sided viewpoint of Srila Prabhupada, it will make our understanding of what it means to be dependent on Krsna material. We might consider such a position to be mundane intellectualism. We might believe that even when a devotee is fully self-realized, he is still beaten by the whips of this material nature. This seems to be the manner, although cushioned by sentimentality, with which His Divine Grace Srila Prabhupada has been portrayed in Lilamrta. The book repeatedly appears to praise Srila Prabhupada, while simultaneously seeing him in another mundane perspective, and describing this to be the praiseworthy quality referred to, as a pious personality. The reader may be reminded of Orwellian double-think, where war is simultaneously peace, ignorance simultaneously knowledge, and so forth. Srila Prabhupada should be, according to sastra, correctly described in the topmost terms (nitya-siddha, mahabagavat, fully surrendered, fully dependent on Krsna, etc.). However, these terms do not sound very glorious when Lilamrta proceeds to delineate the pure devotee’s activities and qualities, from its independent vision, which regularly is found to contradict that of sastra. The GBC is said to have “authorized” the Lilamrta, but it may remain unauthorized. The book puts forth ideas which contradict Srila Prabhupada’s statements. If we accept Lilamrta’s conclusions, we will be forced to subtly interpret Srila Prabhupada’s books in such a way that they may somehow be forced to correspond with the distorted understandings of the Lilamrta. The author quotes a mundane professor’s review of his book, describing it as a “very real human story.” It seems that the Lilamrta has attempted to present His Divine Grace Srila Prabhupada in terms which (it theorizes) can be accepted by mundaners. The approach, when viewed from the sastric vision, appears to be that of keeping the reader at a minimum of arm’s-distance from the true sastric explanation, in a calculated attempt to avoid appearing “unrealistic” to the mundane mind. printing a review which says as much. then describes his alleged dependence on mayavadis, karmis, disciples and even inanimate matter. then describes him to be insecure, vulnerable, directionless, and confused. then describes him as being a writer on the strength of his so-called “psychological nature”. then describes that he was forced by circumstances at times. The author has entitled his book the Lilamrta, “The Eternal Nectar of Lila”. Lilamrta prints a review of His Divine Grace Srila Prabhupada’s life as being “a very human story”. Lilamrta refers to the bonafide spiritual master, Srila Prabhupada, as “Abhay”. The authors of the Lilamrta are initiated disciples of Srila Prabhupada, but unfortunately they have the boldness to refer to their guru as “Abhay”. It is no wonder that the readers of this book consider Srila Prabhupada as a “very human story”! His Divine Grace always referred to his spiritual master, His Divine Grace Srila Bhaktisiddhanta Sarasvati Gosvami Maharaja, in these exalted terms, even when he referred to a pastime of his spiritual master as a 6 month old child. Lilamrta speculates that the nitya-siddha devotee, Srila Prabhupada, also had to learn by mundane experiences. Lilamrta theorizes that the nitya-siddha, “one who lives solely to carry out the order of Krsna”, (Srila Prabhupada) had to struggle to continue his mission. He had to work in the usual material way in order to achieve success. Webster’s Dictionary defines struggle as: “to make violent, strenuous efforts against opposition”. Sastra, however, explains that such a mahabhagavata may speak of himself in terms of his struggling, or how he has not done as well as he would have liked for Krsna, or how he is lower than the worm or the straw in the street, but this is not taken literally. If we see the pure devotee appear to struggle, perhaps we are actually seeing a reflection of the actual struggle which we are undergoing within our own minds. Krsna does everything while He arranges for his devotee to take the credit. The Lilamrta speculates that the nitya-siddha devotee, Srila Prabhupada, was shaken due to the conflict of mundane family life and the orders of his spiritual master. The Lilamrta guesses that sometimes His Divine Grace was obliged, even though he was nitya-siddha, to engage in family life rather than engage in preaching activities, according to his desire. The Lilamrta speculates that His Divine Grace was also dependent on conditioned souls. We are conditioned and have little faith in Krsna. Therefore, in order to insure that our necessities are provided for, we may become dependent on mundane persons or facilities, and make compromises. However, His Divine Grace Srila Prabhupada was never dependent on anyone except Krsna. Lilamrta postulates that His Divine Grace was less secure than bums on the street, and that he was vulnerable, not knowing what to do. Krsna is a person. He personally looks after His devotee and personally protects His devotee in all ways. The pure devotee never seeks anyone else’s shelter. We may think that we are giving the spiritual master our essential assistance, but that is our own misconception. He is actually only engaging us, and that is helping us progress toward taking full shelter of him. The bonafide spiritual master is never unprotected, insecure, or unsettled. He can never be compared to a bum. Lilamrta offers that His Divine Grace was destitute and pitiably desperate. The pure devotee may appear destitute or desperate to the common man, but this is actually never his real position. Just as Vrndavana, India is actually non-different from Goloka Vrndavana, if we have the purified vision to see it, similarly the kalpa-vrksa desire trees supply all needs and opulences for the completely clean-hearted Gosvamis. The sastra concludes that Srila Prabhupada had the same facility wherever he went and at all times, in all circumstances. Lilamrta speculates that His Divine Grace Srila Prabhupada was “in his (material) element” as an editor. The sastra seems to disagree with this sort of vision. The pure devotee’s writing talents have absolutely nothing whatsoever to do with any theorized psychophysical bodily nature. The Lilamrta claims that the mahabhagavat can be moved by force of circumstances. Srila Prabhupada writes that the conditioned soul is forced to act by Krsna’s material energy, but the pure devotee is acting fully under the guidance of Krsna’s spiritual energy. SUMMARY REVIEW OF “LILAMRTA”The Lilamrta did speculate erroneously about the emotions of His Divine Grace Srila Prabhupada. In the process, it has criticized His Divine Grace, though it tries to cover its subtle criticisms with a thin veneer of the mundanely-presented greatness of his struggle through all the internal and external “difficulties”. We have heard that Srila Prabhupada may have sent letters discouraging a biography of stories about himself by any of his disciples. But, if a biography were to be compiled, the Krsna Consciousness Movement could have simply printed statements from His Divine Grace about his own life, minus any misleading commentary. This could have assured the correct transcendental version of the activities and qualities of the topmost paramahamsa devotee of the Lord. Some letters and Indian BTG articles written by His Divine Grace could have been included. And statements directly from Srila Prabhupada’s books on the wonderful and totally transcendental activities and qualities of the pure devotee in his preaching pastimes, would most definitely have made a sastric basis for such a project. As always, by simply repeating from sastra, in context, the words of the liberated soul, it is easier to avoid harmful speculation.